Fig. 1. Raymond Buchs and Kirsch & Fleckner, Saint Peter, stained-glass window, St-Etienne, Jaun (FR), 1908–1910. A recent two-day international conference on ‘Stained Glass from c.1800 to 1945: Terminology – Periodization – Forms’ hosted by the Institute of Art History at Jagiellonian University, Kraków, Poland, provided a unique opportunity to discuss and exchange the research methodologies, themes and challenges associated with the identification, cataloguing, study and interpretation of 19th and 20th century stained glass. As part of the conference, delegates were taken on a guided visit of two major sites in the city of Kraków. Firstly, the dimly lit but stunning Franciscan Church with extraordinary stained glass and a polychrome art nouveau painted decorative scheme by celebrated Polish artist Stanisław Wyspiański (1869-1927), and secondly, St Mary’s Basilica, where we were able to see at close-quarters, from internal scaffolding, the medieval stained glass windows and the altarpiece by Veit Stoss (1448-1553), which is currently undergoing specialist conservation. Conference organiser Prof. Woijech Balus had proposed the topic as a pragmatic way to move this area of research forwards, to provide a space for those working in the area to share best practice and to invigorate the field. Several conference papers focused on recent projects led by member countries of the international Corpus Vitrearum Medii Aevi (CVMA) that have begun to extend their chronological range to incorporate the stained glass productions of the post-medieval period alongside those of the Middle Ages. Tomasz Szybisty reported on a five-year research project of the Polish CVMA, based at Jagiellonian University, Kraków, to produce an inventory of stained glass in over 400 churches in the Krakow and Przemyśl districts of Poland. This survey had provided a chronological framework for the changing styles and development of stained glass in Poland, drawing attention to this neglected aspect of Polish art. As part of the project, which is coming to an end this year, five catalogue volumes have been published along with an online database of stained glass in Poland. Fig. 2. Raymond Buchs & Kirsch & Fleckner, Saint Peter, stained-glass window, St-Martin, Onnens (FR), 1911–1913. Since 2014, CVMA Germany has also published several surveys of 19th century stained glass in Germany and has a growing online database of stained glass in Germany. One of the main areas of current research at the Potsdam base of CVMA Germany is the 19th and 20th century restoration of medieval stained glass, a subject that has historically gained little attention in studies of medieval glass. As Cornelia Aman demonstrated, the restoration of medieval stained glass often involved the creation of modern scenes, and therefore the study of medieval stained glass cannot be divorced from an understanding of the later regroupings, replacements and restorations of historic stained glass undertaken by modern glaziers. For example, a series of surviving watercolour sketches of the medieval glazing at Naumburg Cathedral made by Karl Memminger in the 1870s together with his designs for modern windows had provided invaluable documentation of the history of this glazing. A research project on ‘Medieval and Modern Stained Glass in Austria’ led by CVMA Austria, and based at the Academy of Sciences, Vienna, had since 2015 begun to undertake a survey of Austria’s 19th and 20th century stained glass. Christina Wais-Wolf and colleagues’ current research focused on major monuments with 19th century glazing, including the Franzensburg in Laxenburg, with a unique collection of stained glass amassed by Emperor Franz II from the 1800s to 1830s; and the parish church of Vienna-Breitensee (1896-98), where a scheme of windows commemorating the 50th anniversary of the crowning of Franz Joseph I as Emperor of Austria are currently undergoing restoration. A survey of surviving archives had also been undertaken, and those of the Tiroler Glasmalerei und Mosaik Anstalt (Tyrolean Glass and Mosaic company), a studio founded in Innsbruck in 1861, with a national monopoly whose windows were exported around the world, provided a fascinating resource. Criteria for the project thus combined artistic, political and historical significance, along with the accessibility and documentation of windows. Results of this research will be disseminated through both printed publications and an online database in the future. Fig. 3. Raymond Buchs, Saint Peter, cartoon for the windows of the church Saint-Etienne, Jaun and church St-André, Onnens (FR), 1908–1910. The importance of research into the archives of stained glass studios was further highlighted by Camille Noverraz of the Vitrocentre, Romont, home to CVMA Switzerland, in a study of the Kirsch & Fleckner studio, active in Fribourg from 1898 until 1938. Research into the studio’s extensive archive of design sketches and cartoons now in the collection of the Vitromusée, Romont, has enabled a number of designers of windows to be identified, and designs to be matched with entries in the studio’s order books. It also revealed the collaborative design of stained glass windows, and evidence of the ways in which a bespoke stained glass window could be selected and created from several designs. A memorable example was provided in the cartoons prepared by Raymond Buchs for a window depicting Saint Peter. The main figure of Peter was drawn on a separate piece of paper to the landscape background, to enable the adaptation of the window and the placing of different backgrounds behind the same figure design (see Fig. 1–4). The designs of the Kirsch & Fleckner workshop, along with other collections in the Vitromusée, and stained glass in Switzerland can now be viewed on the Swiss online database – Vitrosearch, launched this month. Other papers considered the wider art-historical implications of studying post-medieval stained glass and many key themes emerged. Silvia Cañellas (CVMA Catalonia) drew attention to the internationalised production of stained glass in the period, revealing the large quantities of stained glass in Catalonia designed by foreign artists or imported from international studios, as well as stained glass designed and made by local artists, who were often inspired by designs circulated through journals and magazines. The archives of Barcelona studio of Rigalt, Granell & Co., deposited at the National Museum of Catalonia, reveal much about how this Catalan studio produced windows from designs by leading decorative artists of the day including Scottish artists Oscar Paterson and E. A. Taylor, French artist René Beauclair, German Herman Göhler and Swiss architect Albert Lüthi. These rich international artistic networks, the global marketing and large-scale exportation of stained glass increased following the international exhibitions of the period, and reception at these events was crucial to these expanding businesses. Fig. 4. Raymond Buchs, background of saint Peter, cartoon for the windows of the church St-André Onnens (FR), 1911–1913. The stained glass of the 19th and 20th centuries has often been dismissed as an era of mass-production, but as Daniel Parello (CVMA Germany – Freiburg) demonstrated, there are other ways of interpreting this large-scale production. The well-known firm of F.X. Zettler & Co. produced more than 12,500 windows between 1800 and 1910. Parello attributed the sheer quantity of production to a number of factors, including the revival of the Christian church and increase of pilgrimage, the popularisation of images as a form of Christian propaganda during the loss of the papal states, the influence of print-making and serial production that enabled images to reach more of the population, particularly through the Bilderbibel, published between 1851–61, and the technical progress and changing economic exchanges that enabled ordering from catalogues. Questions were raised about the delineation between high art and mass production, and the demand for and modes of reproduction. Many of these themes re-emerged in a paper on the American perspective by Virginia Raguin (CVMA USA), which demonstrated how artists such as L.C. Tiffany and John La Farge, so often celebrated for bringing about new art, were actually directly inspired by, copied and adapted from paintings by Renaissance artists, Pre-Raphaelites and symbolist painters such as Gustave Doré, most of which they had only seen through prints, engravings and photographs. Subsequent discussions centred on the circulation of design sources, the role of the musée imaginaire, and how the copying, adaptation and repetition of religious images may have been affirmations of a shared religious iconography and therefore a common Christian identity. Questions of style, originality versus repetition, the re-use of patterns and designs within a single studio as well as across different artistic media were raised by British contributors to the conference. 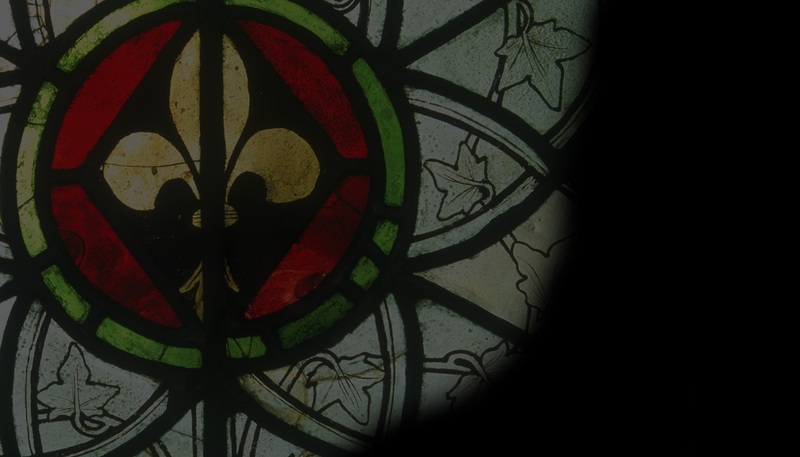 As Martin Crampin (University of Wales) demonstrated, using examples from his comprehensive online catalogue of Stained Glass in Wales, there were multiple interpretations of what constituted ‘medieval’ in the 19th and 20th centuries. The different impulses, inspirations, sources, and intentions of British stained glass artists and studios led to varying and variable experiments in ‘medievalism’ over the period, drawing attention to multiple and diverse interpretations of ‘medieval’ style stained glass. Fig. 5. Details of the choir glazing and figure of St Francis, from the Franciscan Church, Kraków. © Michael and Virginia Raguin. Fig. 6. Details of the choir glazing and figure of St Francis, from the Franciscan Church, Kraków. © Michael and Virginia Raguin. Jasmine Allen (The Stained Glass Museum, Ely) spoke on the subject of intermediality in 19th century stained glass, an art form so often considered in an entirely architectural or religious context, but which she argued ought also to be contextualised within a broader artistic context. By demonstrating that those designing for stained glass were not only well-versed in a number of styles, but also able to copy and adapt designs in a variety of forms for different media, we explored connections and two-way influences between the art of stained glass and painting on canvas and fresco, as well as wallpaper, mosaics, needlework, sculpture and the modern poster in Britain and France. The increased scholarly attention that has been given to the research of post-medieval stained glass in recent years is to be much praised, and the growing number of open access digital catalogues and databases with high quality photographs, as well as traditional printed publications, has opened up greater possibilities for international collaboration. Although methodological approaches and available resources may differ from country to country, the further sharing of knowledge as well as experiences is necessary to understand the increasingly international networks of artists in this period, the various exchanges between different arts and mass-culture, the use and distribution of images, the changing economic context and approaches to form, material and iconography. As Prof. Woijech Balus concluded, 19th and 20th century stained glass presented ‘a host of beautiful problems’; and better criteria need to be developed in order to understand and interpret the productions of this period.